Here is a TTM success with a wide range of 1990s cards. 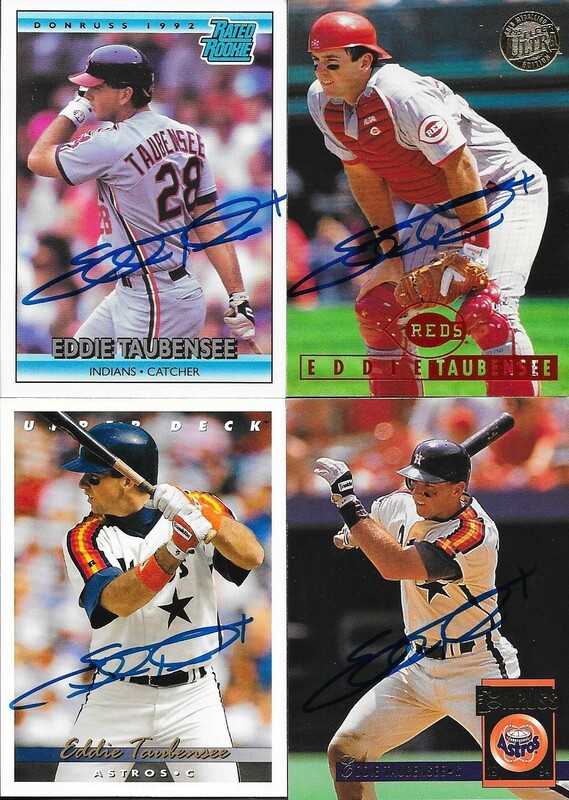 I was lucky enough to have a bunch of different cards to choose from when I mailed my TTM request to Eddie Taubensee on November 8. The above 1997 Finest Warriors was another card that I "prepped" beforehand using one of Chris's school erasers. This card came out looking great, and I really feel like the eraser is doing the trick. I have recently sent out a batch using baby powder instead of the eraser, and I am interested to see if that holds up as well. I will obviously let you guys know if I get that success. 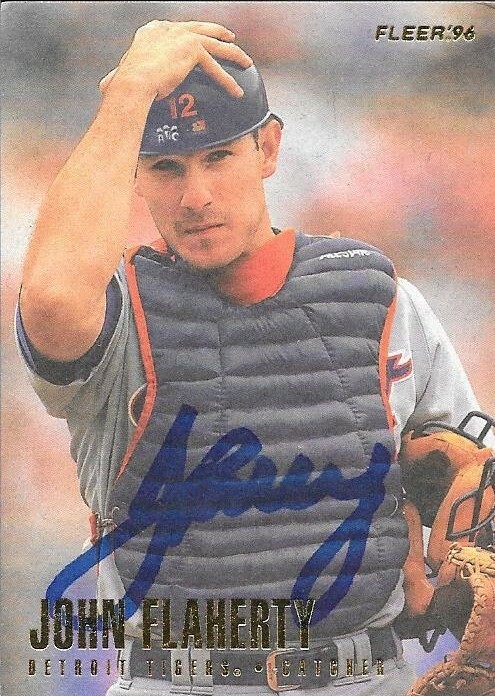 I was able to turn one of my surplus 1995 Topps cards into a TTM success. I had a bunch left over after purchasing boxes of Series 1 and 2 in order to make a dent in my set. 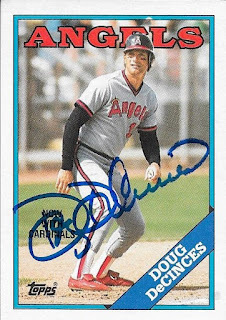 At the time, I didn't have any 1995s represented in my Topps Autograph Project, but now, quite a few have come back, with several more pending. I was happy to send this card off as well, since it came out of a binder that my mom had put together back in 1994. She was working on the 1994 Collectors Choice Silver Signature set, and had an extra of this card in the binder. When I saw that Taubensee signed, it was a no-brainer that this one was getting sent in. The fact that it is a horizontal card helps as well. Here are the other cards that I sent off. Each of them turned out great, and I am glad I chose to send what I sent. Taubensee (b. 1968) played in the majors from 1991 to 2001 for the Indians, Astros and Reds. He had 784 hits, 94 home runs and a .273 batting average. 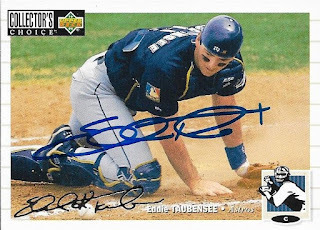 I mailed to Taubensee on November 8 and got the cards back on November 19, for an 11-day TAT. Ah, look at that 1989 Topps. To me, that is still one of the underrated Topps issues, especially since it is a big part of the "overproduction era." The set is important to me, though, because it represents the first baseball cards that I ever owned. So, whenever I am deciding on which cards to send to a former player, 1989 is one that oftentimes finds its way into the envelope. I sent four cards to Kevin Elster on November 9 and got the cards back on November 19, for a 10-day TAT. Another horizontal card was a must in this submission. They always turn out great, and this 1998 Topps didn't disappoint. The only issue is that the foil name on the card doesn't scan all that well, but I don't feel like it takes anything away. Here are the two other cards I sent for signature. I found the 1988 Classic at my LCS after the shop owner let me dig through boxes in the back room. I grabbed a few of them to send off so they would be represented in my album. 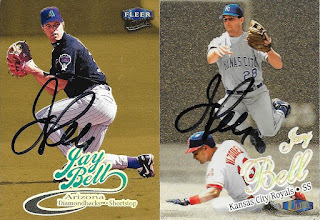 The 1992 Pinnacle (on the left) is just a nice-looking card that I thought would look even better with a signature. It turned out pretty well; the blue Sharpie fitting in nicely, even though Elster signed it in an odd direction to the photo. Elster (b. 1964) played in the majors from 1986 to 1992, 1994 to 1998 and 2000 for the Mets, Yankees, Phillies, Rangers, Pirates and Dodgers. He had 648 hits, 88 home runs and a .228 batting average. 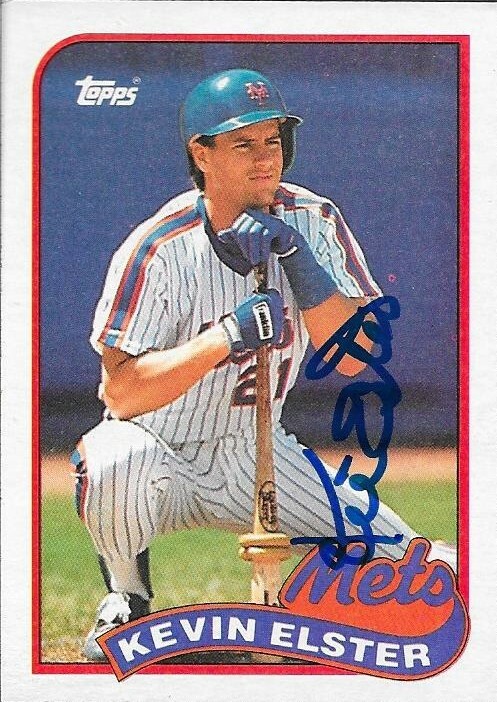 He won the World Series with the Mets in 1986. I grabbed a bunch of late 60s/early 70s cards from my LCS that I hoped to use for TTMs. I've been getting a good deal on the cards, so I have stocked up and sent a bunch out recently. One of the first batches to come back came from Frank Quilici on these three cards. I didn't have very many extra 1973s at all, so I made sure to get this one signed. 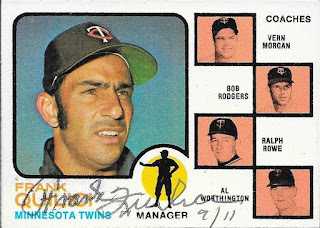 It also is a nice representation of the manager cards from that set. Quilici signed it in ballpoint pen and inscribed with his uniform numbers 7/11. Who was the pitcher that you loved to face? What would you say was the proudest moment of your career? When my Mom and Dad in the park when I was playing 2nd base. Pretty simple and to the point, but I always love getting a response from the players. I save all of the notes that they send back. Quilici (b. 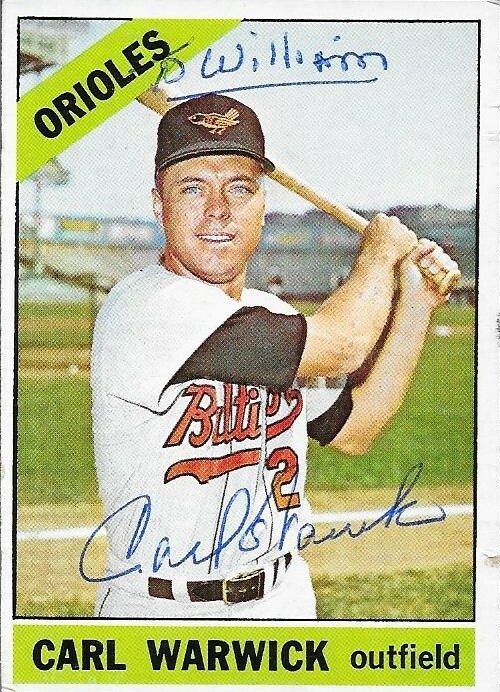 1939) played in the majors from 1965 and 1967 to 1970 for the Twins. He had 146 hits, 5 home runs and a .214 batting average. 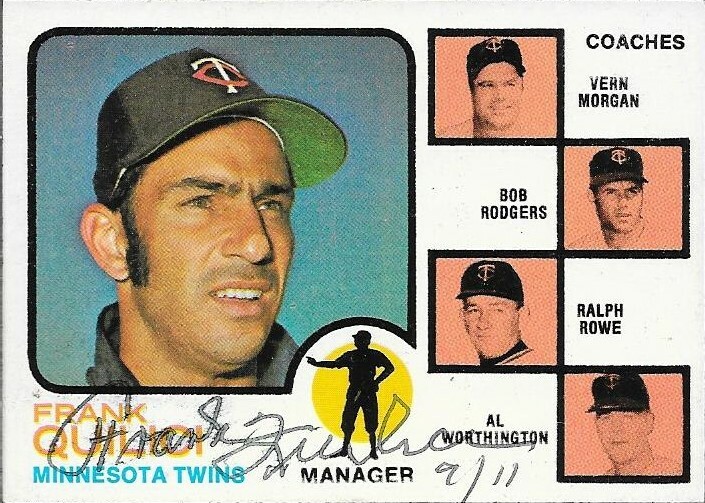 He went on to manage the Twins from 1972 to 1975, finishing with a record of 280-287 (.494 winning percentage). 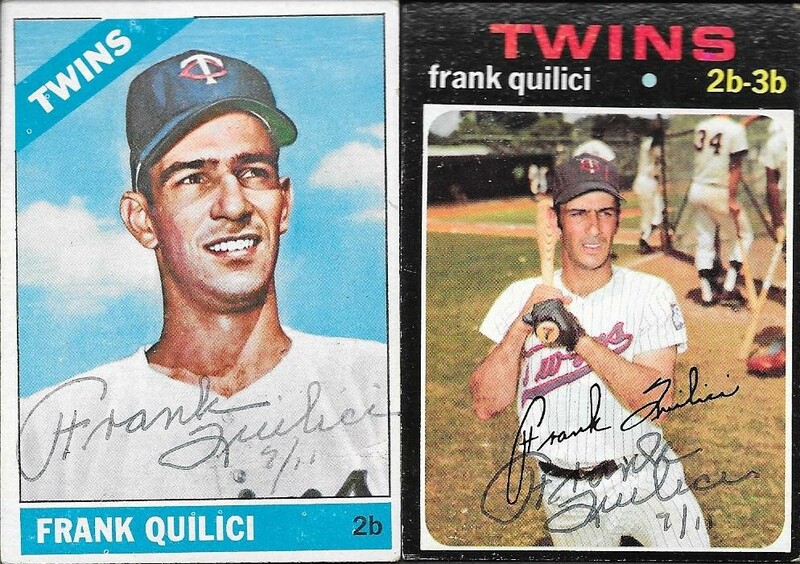 I mailed to Quilici on November 12 and got the cards back on November 19, for a 7-day TAT. 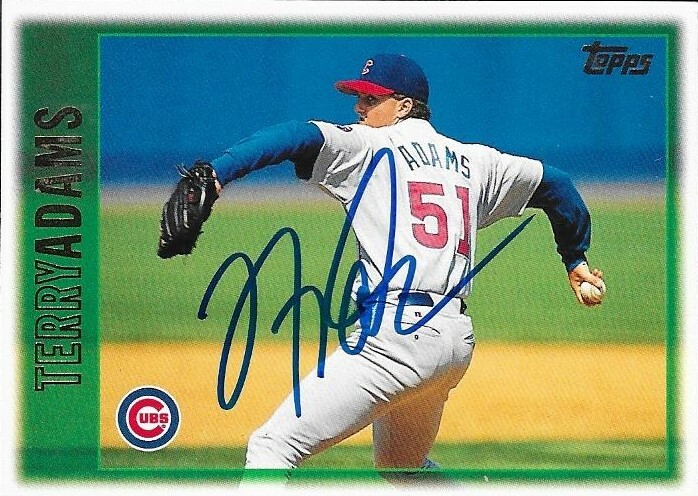 I have been getting a ton of TTM successes from guys who played in the late 1990s. I think that is just how it has worked out lately, since I have been working on the 1995 Topps set, and I busted a couple boxes with Chris. 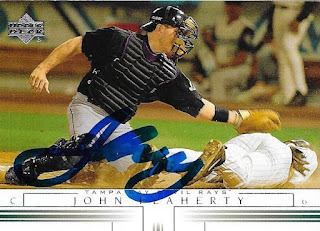 The above card of John Flaherty came out of a box of 1996 Fleer that I have been holding onto for about 10 years. I bought that box and a box of 1994 Upper Deck from a card shop in Gastonia, NC when it was closing. I figured that Chris and I would have some fun with the boxes a couple weeks ago, so we opened them. 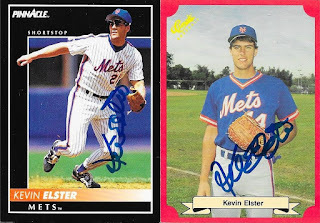 Fleer toyed with the "matte" finish cards for a couple years, citing that they would be better for autographs. I really like the cards, and yes, they work great for autos. My only problem with them is that they are a pain to go through quickly, as the rough finish makes the cards stick together some. I added four years of Topps with this TTM success, clockwise from top left is 1996, 1998, 2002 and 1999. I didn't have any 1996 at the time of this success, so knocking this off the list leaves me with only 2008 to add to my Topps Autograph Project. I have several 2008s out for autos, just none have come back yet. I'm kind of interested in seeing which is the first to come back. Speaking of my Topps Autograph Project, I have added the tally to my wishlist spreadsheet, in case anyone wanted to see how many of each Topps year that I have so far. An interesting note is that 1985 has finally surpassed 1987 as the set I have the most autos on, now. Flaherty (b. 1967) played in the majors from 1992 to 2005 for the Red Sox, Tigers, Padres, Devil Rays and Yankees. He had 849 hits, 80 home runs and a .252 batting average. I mailed to him on November 8 and got the cards back on November 18, for an 11-day TAT. I got a nice TTM success from former Oriole, Carl Warwick after finding his card in my Orioles box and checking to see if he signed TTM. I was even happier to find that I had one of his 1964 Topps cards in my vintage box, so I was able to get two cards sent off. I love this 1964 Topps because of the Colt .45s jersey. I might have to find one of those jerseys at some point. They look really cool. Here is the 1966 Topps that had taken up residence in my Os box. This card turned out nice, as well. I mailed to Warwick on November 11 and got the cards back on November 18, for a 7-day TAT. Warwick (b. 1937) played in the majors from 1961 to 1966 for the Dodgers, Cardinals, Colt .45s, Orioles and Cubs. He had 363 hits, 31 home runs and a .248 batting average. He won the World Series in 1964 with the Cardinals. I have been picking up some cared here and there at my LCS to send TTM. 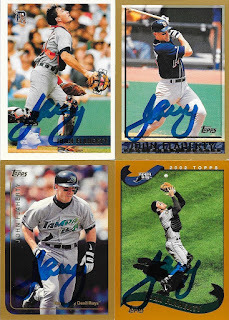 The shop has a bunch of nice late 90s cards that I never got to pick up when they were live, since I was out of the hobby at that time. 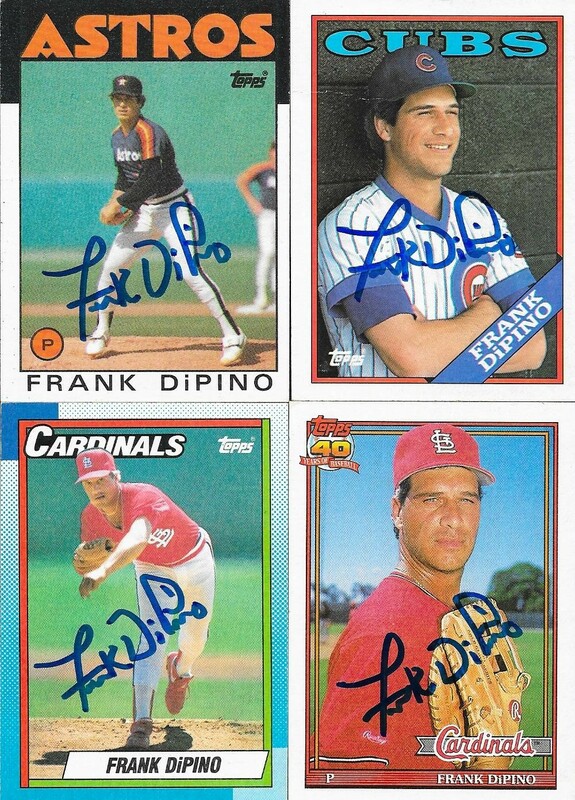 Picking up these cards has helped me find some nice gems to send TTM. 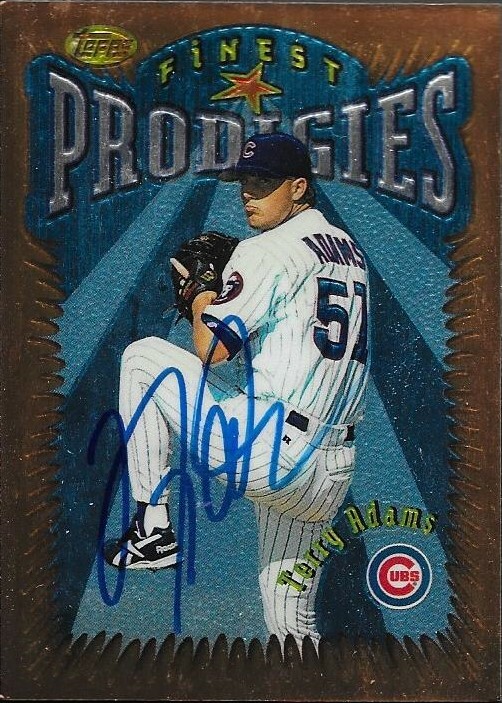 The above 1996 Finest Prodigies card is a fine example. 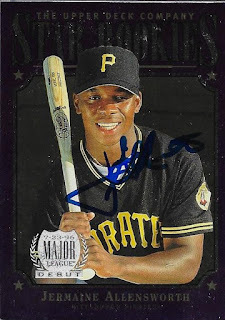 It also is an example of my learning more and more about getting cards signed. I rubbed this card up with one of Chris's pencil top erasers in order to assist in making the auto "stick" without beading and smearing. I must have done a good job, because the auto turned out really nice. The scan really doesn't do well for this card, as it looks great in person. I also was able to add a nice horizontal card to the auto collection. This one looks really great. I also didn't have very many 1997 Topps, yet, so this will bump that number up. Here are two other cards that I was able to get. I realized that I have a BUNCH of 1998 Topps. I have been able to get several signed; the second-most out of the 1990s, so far (6 compared to 8 from 1990). 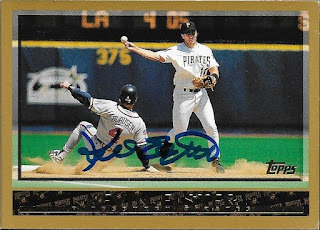 Finally, here is a nice 2002 Upper Deck. This is a really sharp-looking set from the early 2000s that may be overlooked. I'm not the biggest UD fan, but they did sport some nice sets from time to time. It's just too bad they dug their own grave. I mailed these cards to Terry Adams on November 9 and got the cards back on November 18, for a 9-day TAT. Adams (b. 1973) played in the majors from 1995 to 2005 for the Cubs, Dodgers, Phillies, Blue Jays and Red Sox. He had a record of 51-62 with 691 strike outs and an ERA of 4.17. He was a part of the 2004 World Series Champion Red Sox, but did not appear in the playoffs. 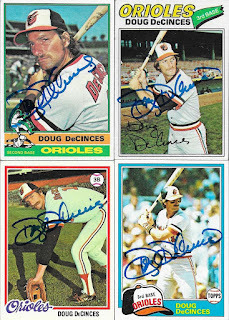 For a $10.00 check, I was able to add quite a few signed cards as a TTM from former Oriole, Doug DeCinces. Known as the guy who replaced Brooks Robinson at 3rd base for the Orioles, DeCinces had a pretty good career. This 1979 Hostess card came from one of my first deals with my good friend, Max. I'm glad to be able to still be getting some of these signed. I also added several of DeCinces's Topps issues. They all turned out great, I think! 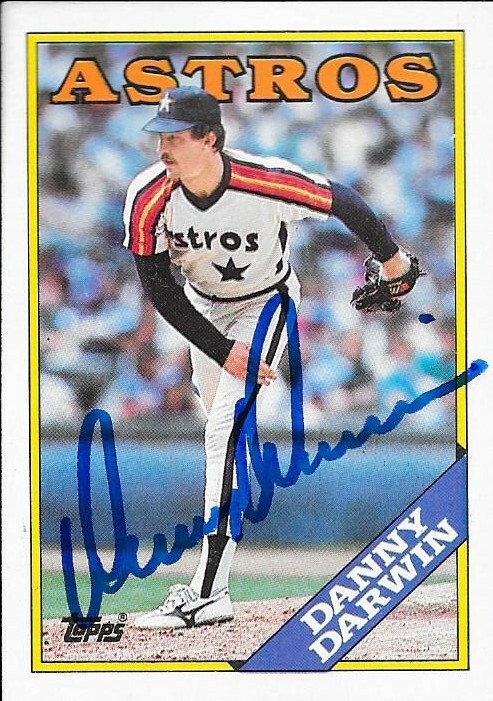 This 1981 Fleer was a nice one to get signed. It might not be the greatest set, but the cards do look nice when signed. Funny thing, though, DeCinces never won a Gold Glove Award. Finally, this 1988 Topps really turned out great. The blue sharpie even fits with the blue sub border and name banner of the card. 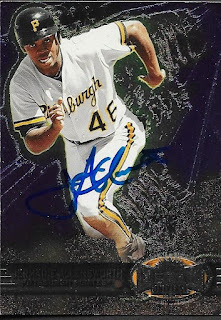 I was really happy with this one, even though he wasn't an Oriole on this card. DeCinces (b. 1950) played in the majors from 1973 to 1987 for the Orioles, Angels and Cardinals. He had 1,505 hits, 237 home runs and a .259 batting average. He finished as high as 3rd in the AL MVP voting (1982, his first season with the Angels) and was an All Star in 1983. He appeared on the 1993 Hall of Fame ballot and received 0.5% of the vote. I mailed the cards to DeCinces on November 7 and got the cards back on November 17, for a 10-day TAT. He signs for a fee, and I felt like $10.00 for 7 cards was not bad at all. It almost worked out that this TTM success would be shown on November 22, but my success from Steve Balboni made it not line up. 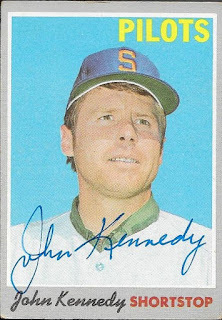 This is probably good, because I doubt many people would have gotten the irony of my posting of a John Kennedy card on November 22. 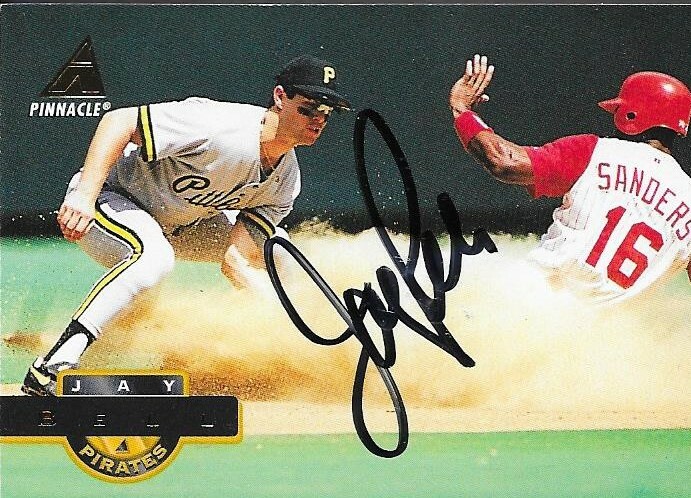 Anyway, I know that was a stretch, but hey everyone, I got a TTM success from John Kennedy. What makes this better is that it is yet another Seattle Pilots card. I have lost count on all of the living Pilots that I have gotten, but I know it is quite a few. I mailed to Kennedy on November 9 and got the card back on November 17, for a \n 8-day TAT. Kennedy (b. 1941) played in the majors from 1962 to 1967 and 1969 to 1974 for the Senators, Dodgers, Yankees, Pilots, Brewers and Red Sox. He had 475 hits, 32 home runs and a .225 batting average. He won the World Series in 1965 with the Dodgers. 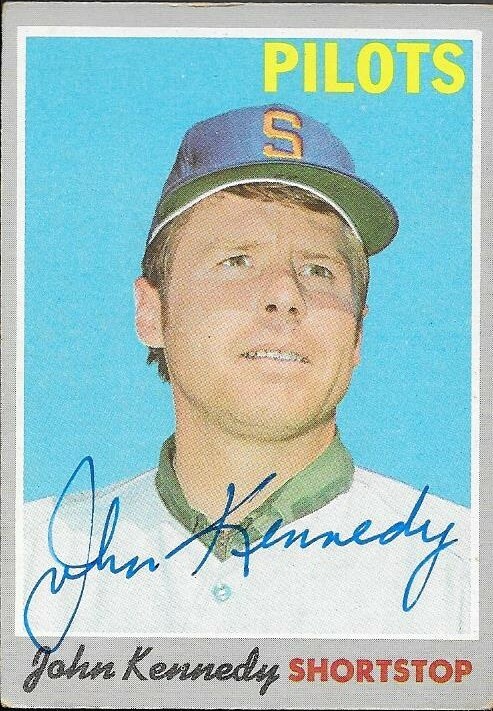 Kennedy appeared on the Hall of Fame ballot in 1980, but did not receive any votes. I received a TTM success from another former Yankee, this time, one from Steve Balboni. I mailed him 2 cards, but he only signed one. The above 1984 Topps turned out nice, so there are no complaints. I mailed to him on November 3 and got the card back on November 17, for a 14-day TAT. He also returned the other card, unsigned. It was a 1987 Topps. Balboni (b. 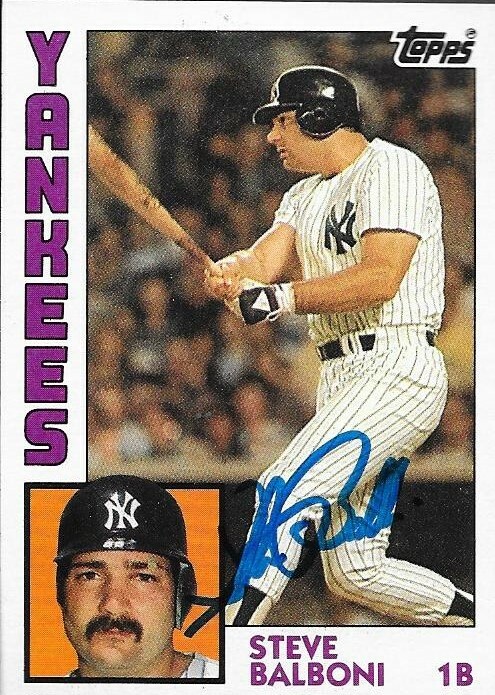 1957) played in the majors from 1981 to 1990 and 1993 for the Yankees, Royals, Mariners and Rangers. He had 714 hits, 181 home runs and a .229 batting average. He finished as high as 19th for the AL MVP (twice, 1984 and 1985). He won the World Series in 1985 with the Royals. I hope you all aren't tired of my TTM posts. Because, well, I still have a TON to write about. This one was rather interesting in that the cards I got back signed were not the ones I mailed off, but I guess a success is still a success. I mailed 4 cards to Pat Kelly on November 3. One of the cards came back, but it wasn't signed. I got these two, which were ones I didn't send, but they are a 1998 Score (above) and the 1992 O Pee Chee (below). I had a few of the Scores available to send, but I opted to send other cards ahead of them. Oh well! Kelly (b. 1967) played in the majors from 1991 to 1999 for the Yankees, Cardinals and Blue Jays. He had 495 hits, 36 home runs and a .249 batting average. I mailed to him on November 3rd and got the cards back on November 15, for a 12-day TAT. 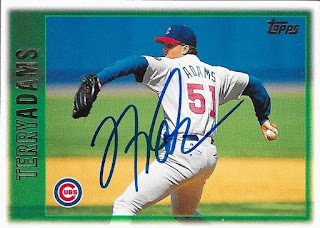 I really enjoy it when a player who had a long career will sign TTM. It is even better when they will sign multiple cards. This is the case with Danny Darwin. I had so many cards of his to choose from, I had to leave out a ton. I was able to, however, make a nice mix of cards from his career and they all came back looking great. I found the above 1994 Pinnacle Museum Collection at my LCS and since I knew I was going to send to Darwin, I picked it up. It was the first card of his that I pulled when I started getting my request together. The card came back looking great. Even if it was the only card I got back, it would have been worth it. Luckily, I got back everything that I sent (all 7 cards). I found the 1983 Fleer (left) in a box of old Fleer cards that Mom picked up for me. The 1991 Fleer (right) came out of a bunch of packs that Chris and I busted a couple weeks ago. Those packs had been residing in my closet forever, so we finally decided to open them. Now, at least one of the cards will be part of my TTM/IP auto album. I had opened a ton of these 1994 Leaf way back when they had come out. Unfortunately, most of what I had from back then melded together, as is the case for a lot of mid-90s junk wax. The gloss on the cards melts if the cards are stored in a hot location (attic) and the cards get sealed together in some sort of a brick, suitable for kindling. My mom found a box of cards that had a bunch of the 1994 Leaf, so I decided to send this one along so that the Leaf set was represented in the album. 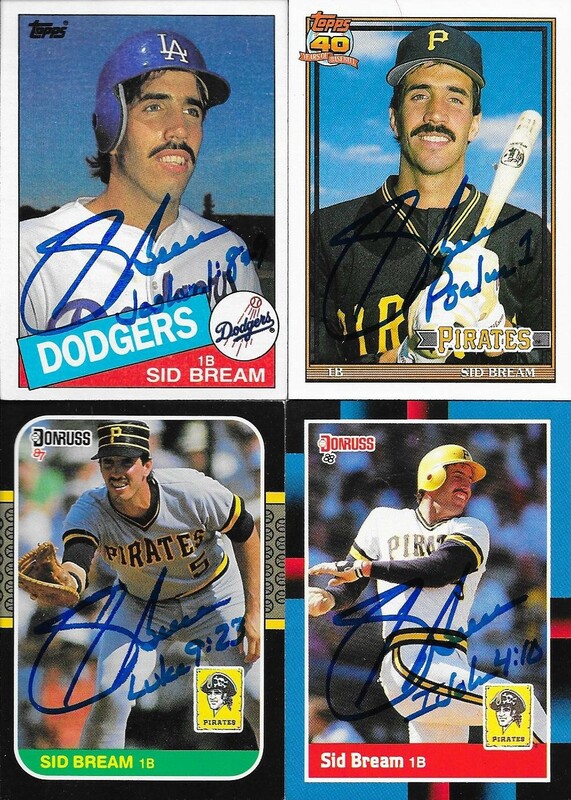 Finally, I sent a few Topps cards along from my boxes so that I could add some tick marks to different Topps sets for my Topps Autograph Project (which is coming along nicely, I may add). The above 1988 Topps looks great, and that set has really grown on me as one of the better ones to get signed. 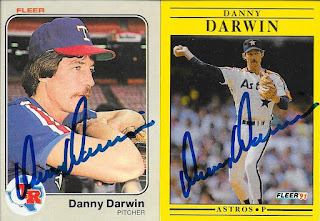 Darwin's choice of a blue Sharpie really pops with these two specimens. The 1982 (left) and 1985 (right) Topps really look nice. 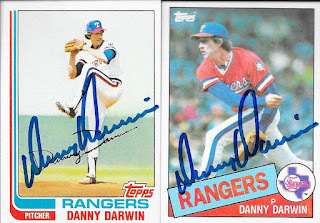 Pair that with the cool, retro Rangers jerseys, and I ended up with an awesome TTM success! Darwin (b. 1955) played in the majors from 1978 to 1998 for the Rangers, Brewers, Astros, Red Sox, Blue Jays, Pirates, White Sox and Giants. He had a career record of 171-182 with 1,942 strike outs and an ERA of 3.84. He played in the majors for 21 seasons and never appeared in a playoff game and also never appeared on any Cy Young or MVP ballots. He did appear on the 2004 Hall of Fame ballot, but did not receive any votes. I mailed to Darwin on November 7 and got the cards back on November 15, for an 8-day TAT. I was going through my Orioles box and found this one lonely 1979 TCMA among the cards of past Orioles. A check to sportscollectors.net showed that the guy depicted on the card, Bob Harrison had a great return rate via TTM, so I figured I would put the card to use. I mailed the card out on November 7 and the card came back on November 15, for an 8-day TAT. Harrison (b. 1930) played in the majors in 1955 and 1956 for the Orioles. He only appeared in two games total in his time in the Majors, pitching to an ERA of 12.27. He didn't pick up a win or loss, leaving him with a 0-0 record. Also, he only pitched in 3.2 innings. Harrison was signed by the New York Giants prior to the 1949 season, then was picked up by the St. Louis Browns via the minor league draft in 1950. 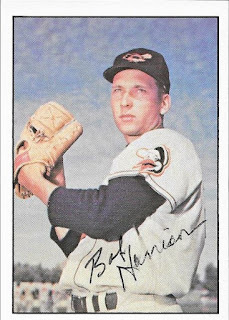 He remained in the Browns/Orioles system until he received his call-up to the Majors. His minor league stats are incomplete, as most older players like that are known to be. His baseball-reference page shows that he also spent a season in Cleveland's system. From the stats that hey have, Harrison had a mnor league record of 66-85. His ERA stats are incomplete. 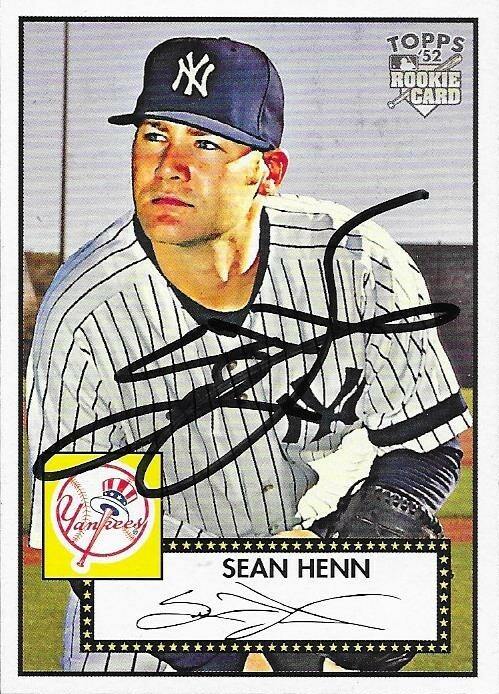 I'm glad I sent off this card for a TTM autograph. 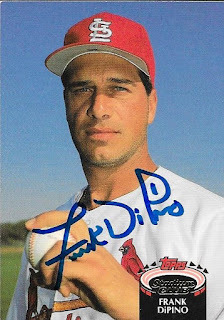 Otherwise, I would have never known that this former Oriole ever made it to the big club. Now, I have his autograph and can put it with the rest of my former Orioles. I received a pretty cool TTM success on Monday when I got two signed cards back from former pitcher, Sean Henn. I actually got the above 2007 MLB Artifacts out of a box of cards that my friend, Pete, gave me. 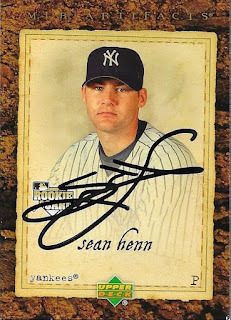 When I saw that Henn signed TTM, I figured these would be nice "different" cards to add to my binder. I busted a box of these 2007 Topps Rookie 52 cards back when they came out. I had put the bulk of them away in my rookie box, and fished this out for the TTM attempt. It turned out really nice. Henn (b. 1981) played in the majors from 2005 to 2009 and 2013 for the Yankees, Padres, Twins, Orioles and Mets. He had a career record of 2-10 with an ERA of 7.42 and 63 strike outs. 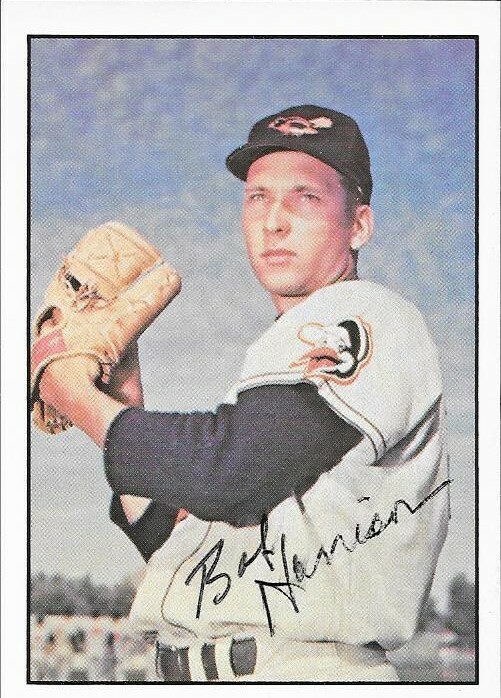 I had completely forgotten that he made it to the Majors with the O's; I thought he was a more recent minor league pickup. I mailed the two cards to Henn on November 2 and got the cards back on November 14, for a 12-day TAT. I'm learning all of the time about tricks and stuff concerning TTMs and autographing. I'm 36, but I am really late to the game with some of this. So, I have been taking information from my much younger friends on the art of collecting autographs. One such trick I have picked up is that you should rub up a chrome card (or use baby powder) so the autograph holds better. This is the first chrome card I have gotten back since I have been using one of Chris's school erasers to rub up a card. 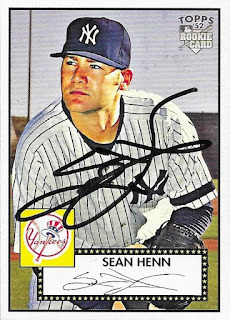 Unfortunately for me, the jury is still out on whether or not I did a good job, because the sharpie used for this card looks like it was just about dead. Not complaining at all, I can still see the auto, and the card is cool, so I will continue to wait and see what other chromes I sent out look like when they come back. This is a 1997 Bowman's Best that I got signed by former Cub prospect, Pat Cline. I mailed to Cline on November 7 and the card came back on November 14, for a 7-day TAT. Cline (b. 1974) never broke into the majors. He was a 6th round pick in the 1993 amateur draft and bounced around the Cubs, Brewers and Reds systems. 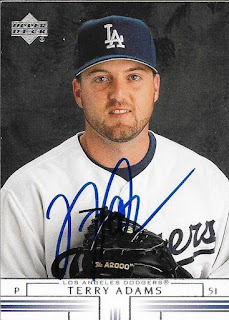 He reached AAA with the Cubs and Brewers systems before calling it a career in 2000 at the age of 25. I have been making frequent stops at my LCS to ick up some really cool cards from the mid-90s to try for some TTMs. 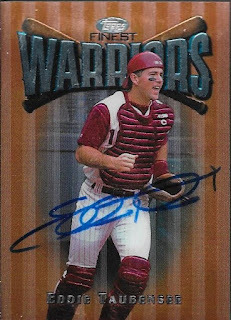 The shop owner has a box of cards like Bowman's Best, Fleer Metal, Fleer Ultra Gold Medallion, etc that I have really wanted to see come back signed. 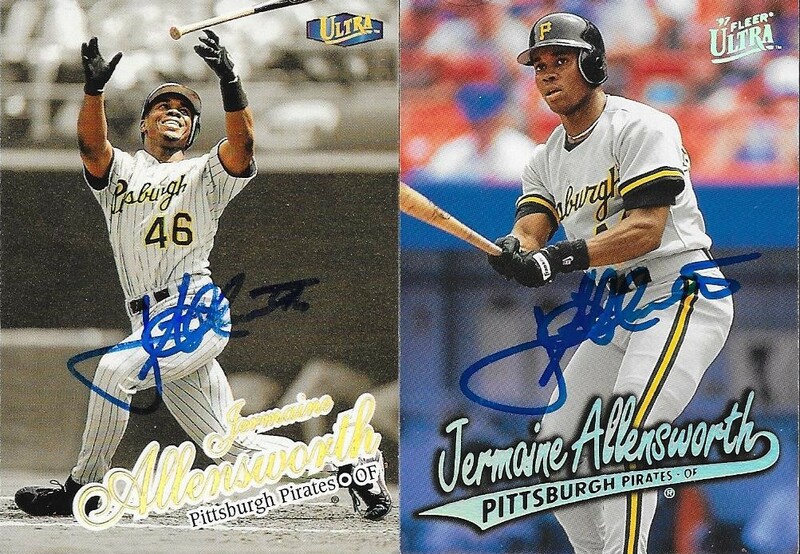 The above 1997 Fleer Metal Jermaine Allensworth is a prime example of the kinds of stuff I have been really excited to see come back. Of the four Allensworth cards that I sent, this one was the only one that I had found in my own collection. The others were ones I pulled from the box at my LCS. I was content in just sending this one card to him, but when I found the others at the shop, that added to my excitement about going ahead and sending these out. The scans of the top two cards don't really do them justice. They look great in person. The scans of these two cards, though, really turned out nice. These are two different years of Fleer Ultra Gold Medallion. The card on the left is a 1998 Gold Medallion and the card on the right is a 1997. The 98 looks more like a Flair product (man I miss that set) and the 97 looks more like a tipical Fleer Ultra offering. Allensworth (b. 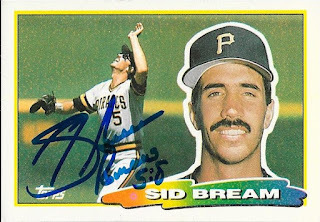 1972) was a first round draft pick (1993, 34th pick) by the Pittsburgh Pirates. He played in the majors from 1996 to 1999 for the Pirates, Royals and Mets. He had 268 hits, 15 home runs and a .260 career average. I mailed to Allensworth on November 1 and got the cards back on November 12, for an 11-day TAT. 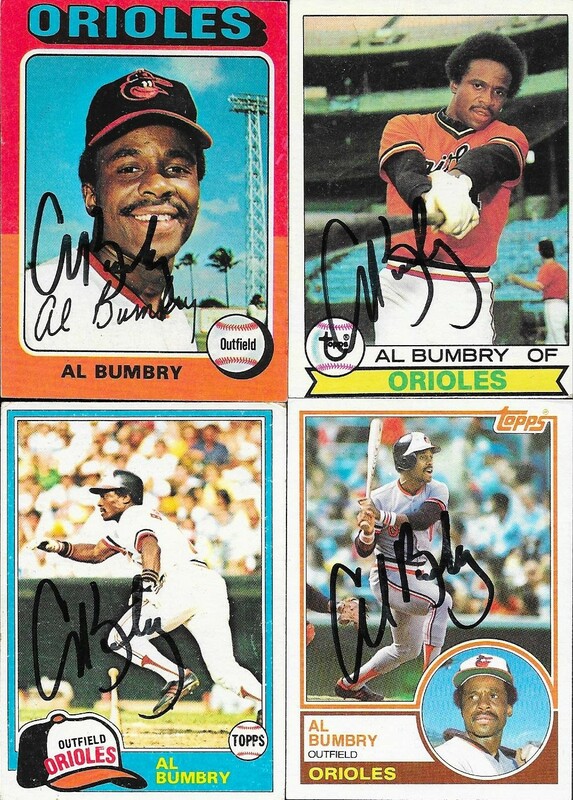 A TTM request I sent back in May finally came Saturday when I received 6 cards from former Oriole, Al Bumbry. 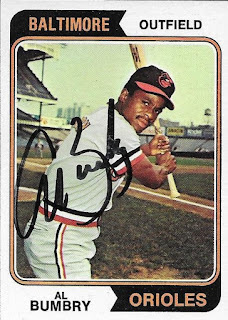 I have met Bumbry at Camden Yards, and also got a ball signed by him in a Tristar Mystery box, but I wanted to see if I could get a TTM return of him on some cards I've had for years in an Orioles album. I had so many cards to choose from for Bumbry, I really enjoyed the selection process of what I wanted to send him. 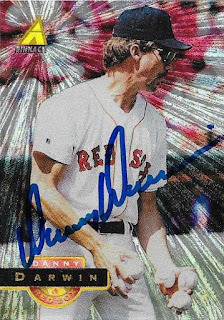 I didn't have any cards signed from this 1993 Ted Williams product, so I figured this one would look nice. 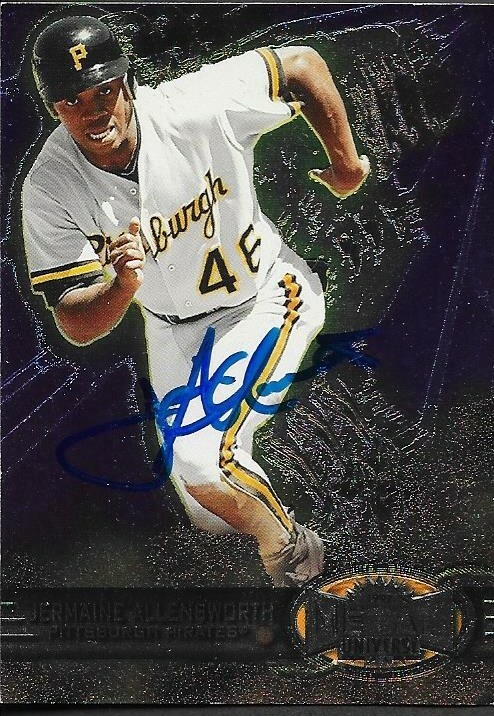 The auto smeared just a touch, but the card still looks great! 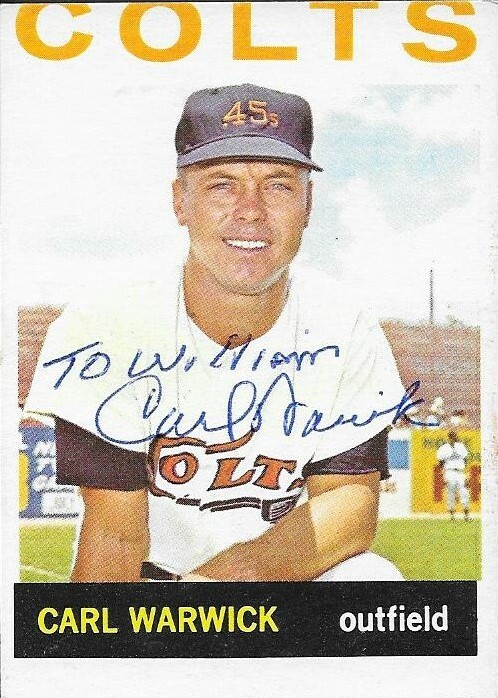 This card marks only the fourth 1974 that I have been able to get signed. 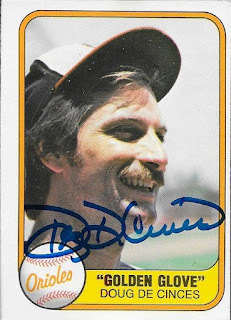 I don't have any bulk '74s at all, so that year is very under represented in my auto album. 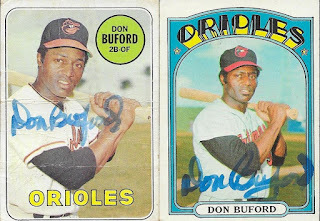 I have quite a few 75s, thanks to my buddy, Max, but the one I got from Bumbry (top left) was in my album. I probably got the card when I was building the 75 set years ago. Same with the other cards in this scan. They all came out of my O's album. Now, they will be transferred into my autograph album. Speaking of albums, I have not started my third autograph album, after filling up two others to capacity with IP/TTM autos. Bumbry (b. 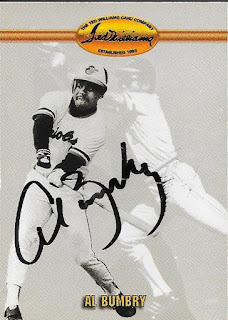 1947) played in the majors from 1972 to 1985 for the Orioles and Padres. He had 1,422 hits, 54 home runs and a .281 career average. He was the 1973 AL Rookie of the Year. He was an All Star in 1980 and finished 13th in the AL MVP voting (his only time on the ballot). Bumbry won the World Series with the O's in 1983 and appeared on the 1991 Hall of Fame ballot, but did not receive any votes. 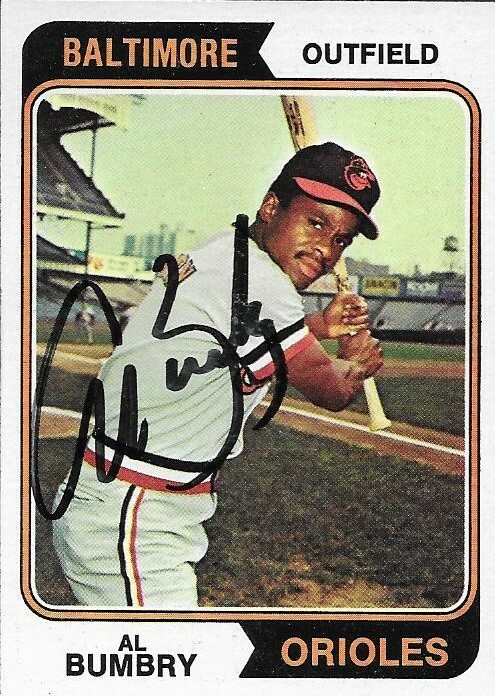 I mailed to Bumbry on May 2 and got the cards back on November 12, for a 194-day TAT. 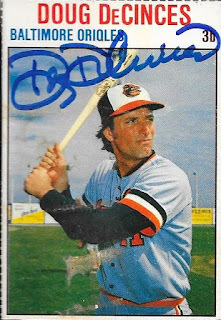 I'm always happy to receive TTM successes from former Orioles. 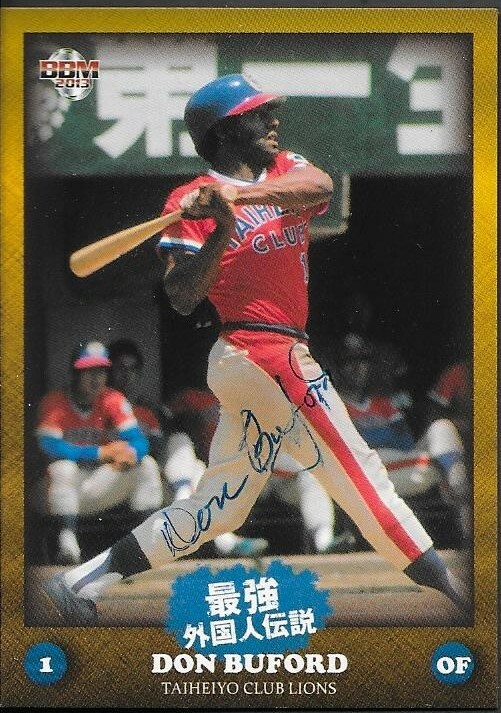 When I got this one in from Don Buford, I was equally excited that I was able to get signed one of the Japanese cards that my friend Ryan gave me. I had hoped that Buford would sign it in blue sharpie, but the ballpoint pen will have to do. The card is still really cool, and will look nice in my album. 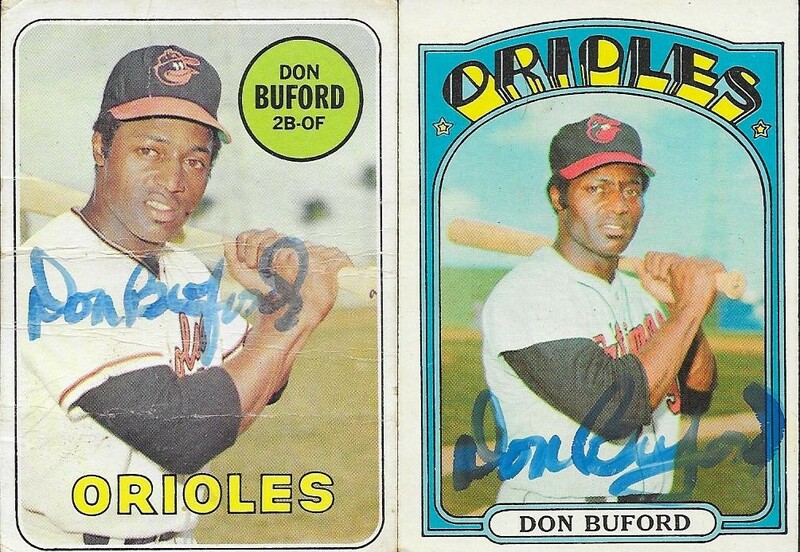 I was also able to repurpose a beat up 1969 Topps that had been in my Orioles box. I also raided my 1972 Topps partial set to add another card to the package. They all turned out pretty nice, I think. Buford (b. 1937) played in the majors from 1963 to 1972 for the White Sox and Orioles. 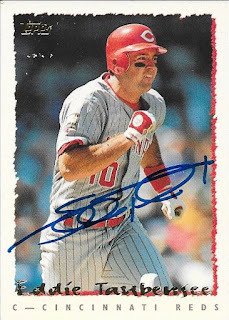 He had 1,203 hits, 93 home runs and a career average of .264. He was an All Star in 1971 and finished as high as 15th in the AL MVP voting (1968). He won the World Series with the O's in 1970. I mailed to Buford on November 5 and got the cards back on November 12 for a 7-day TAT. I sent along $5.00 to cover his signing fee. I received a TTM success from another guy I had been putting off for a while, but finally mailed a request. My friend Max had been telling me for a while to send to DiPino, and I finally got it out on October 25. 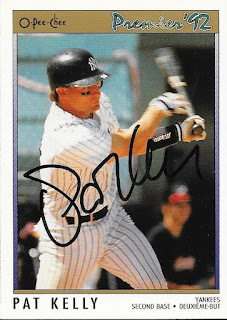 I was able to get a few cards signed, like the above 1992 Topps Stadium Club. 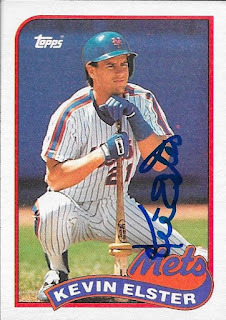 I have a bunch of those Stadium Clubs but they haven't been able to make the cut with some other TTM requests, so it was nice to finally get one back signed. I was also able to get a few Topps years signed. 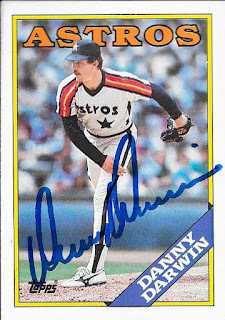 I like the old Astros jersey on the 1986 Topps. All of the cards turned out great, though. DiPino (b. 1956) played in the majors from 1981 to 1990 and 1992-93 for the Brewers, Astros, Cubs, Cardinals and Royals. He had a career record of 35-38 with 515 strike outs and an ERA of 3.83. I mailed the cards out on October 25 and got them back on November 10 for a 16-day TAT. There are a few players in my "to be TTMed" box that have sat in there for quite a while, now. Mostly because the player charges a fee for an auto and I rarely have cash. 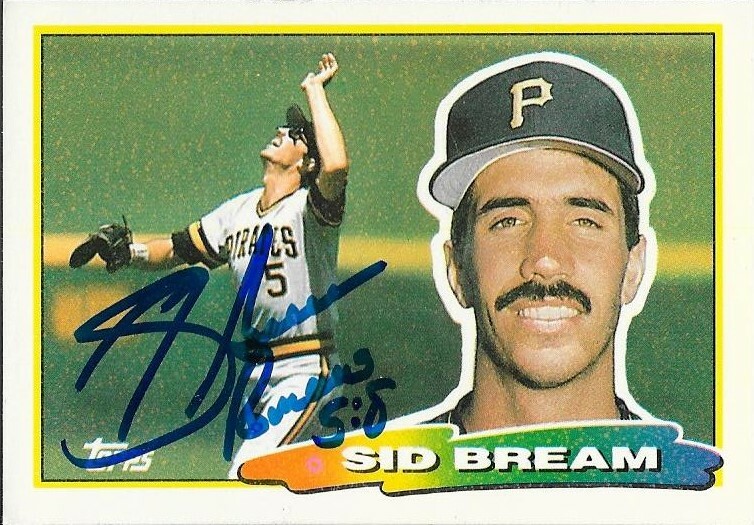 I finally was able to send off for one player recently, Sid Bream. 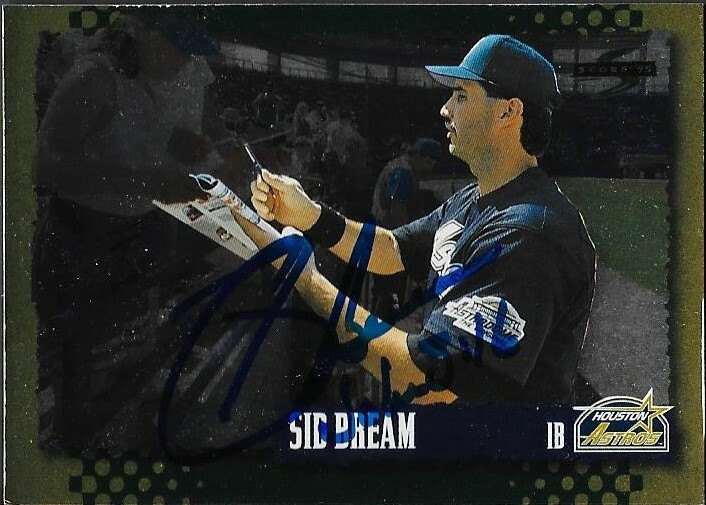 Bream signs for $1.00 per card, and I had $7.00 that I could send, so I went ahead and knocked him off of my list. The above 1995 Score Gold Rush didn't scan all that great, but it was a card that I was most excited to see come back. It looks great, in person. I got a box of cards from my brother, John, a while back that had a ton of these Topps Big cards. I pulled quite a few of the guys that I knew signed TTM, and one of these made the cut when I was selecting Bream cards to send out. 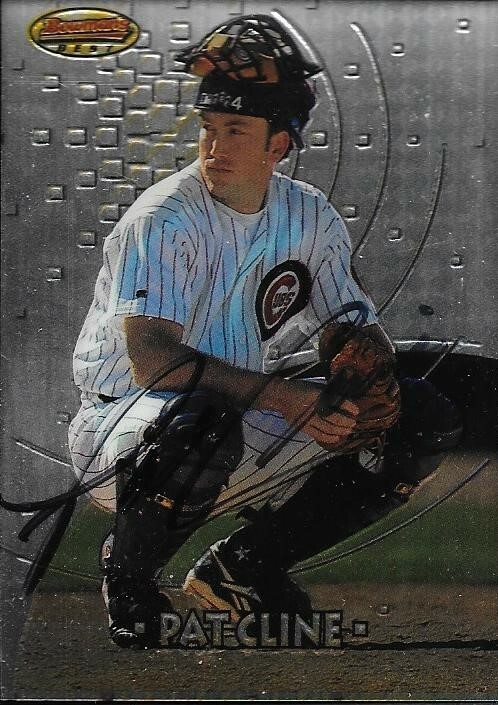 I'm really glad I sent this one because not only does it look good when signed, but it also scanned great as well. I have a soft spot for 1992 Donruss Triple Play. I had built the complete set once as a kid, only to leave it lying around and it got displaced. Oops. 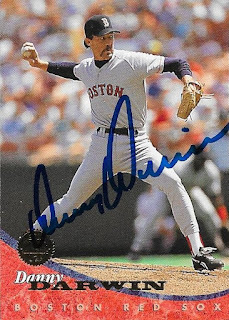 The cards aren't worth much at all, but they look great when scanned, and turn out really well when signed. I had so many Bream cards, I had a bit of a hard time deciding which to send off. I decided on a couple Topps cards to add to my yearly tallies, and a couple under-represented Donruss cards. The 1988 Donruss turned out really nice. I have cards from that year coming out of my ears, so it was nice to be able to take at least one of them and give it a home in my TTM/IP album. Bream (b. 1960) played in the majors from 1983 to 1994 for the Dodgers, Pirates, Braves and Astros. 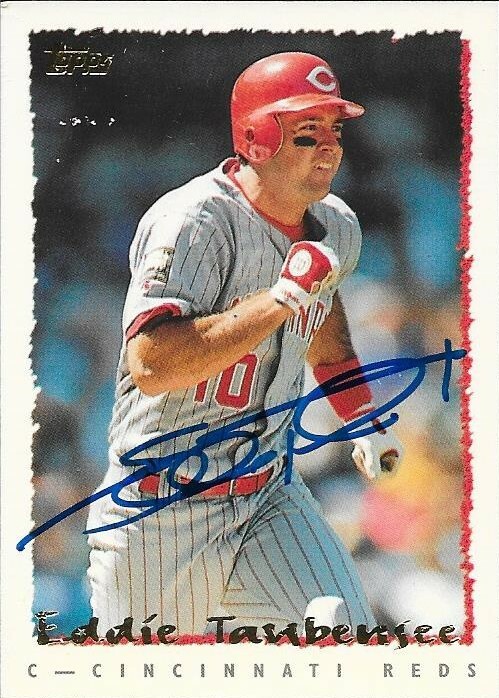 He had 819 hits, 90 home runs and a career average of .264. 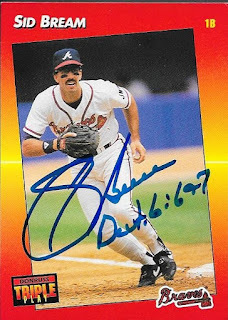 He is best known for beating Barry Bonds's throw in Game 7 of the 1992 NLCS that put the Braves over the Pirates. I just watched the Youtube video of the slide, and it was a great play! I mailed to Bream on November 1 and got the cards back on November 10, for a 9-day TAT. He charges $1.00 per card and includes a bible verse on each card. He also has a really nice signature. Yesterday, a ton of TTMs came rolling in, after not receiving many this past week. Now, with no mail today, I might be able to catch up a little bit. Maybe not. Anyway, I was really happy with this TTM success from Jay Bell. I was able to get some great cards signed, a few of which I picked up at my LCS. The above 1994 Pinnacle might be my favorite of the bunch, and I believe it either came from one of the boxes Mom got me, or it may even be from my original childhood collection. I don't remember, but regardless, it is a great shot. Horizontal cards always look best when signed, and this one does as well. The action shot helps also! I'm pretty sure that these two Fleer Ultra Gold Medallion cards came from my LCS, I believe. They are from 1998 and 1999 and both look really cool. I was out of the hobby when these came out, but I think I would have really enjoyed opening packs of this had I stuck around. 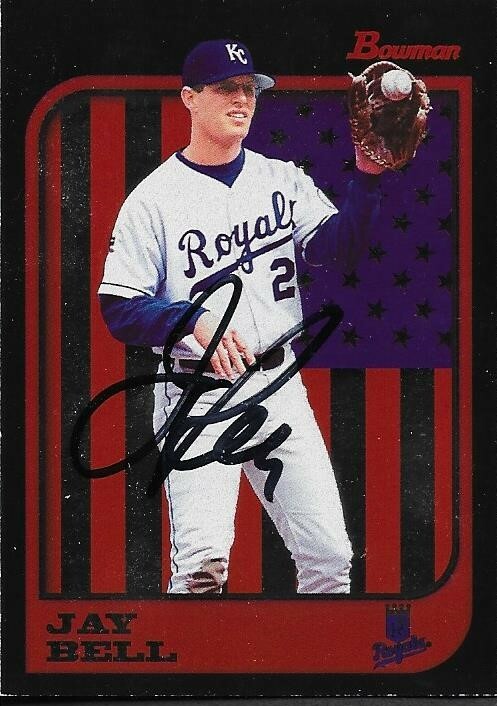 Finally, here is a 1997 Bowman. I guess this is Bowman Chrome, but it is more foil than chrome, so I don't really know. The card looks great, though. I'm really happy I found this at the LCS and was able to get it signed. Bell (b. 1965) played in the majors from 1986 to 2003 for the Indians, Pirates, Royals, Diamondbacks and Mets. He had 1,963 hits, 195 home runs and a .265 batting average. He was a two-time All Star, was a Silver Slugger Award winner and Gold Glove Award winner. He finished as high as 12th in the NL MVP voting (1991) and won the World Series with the Diamondbacks in 2001. He appeared on the 2009 Hall of Fame ballot and received 0.4% of the vote. I mailed to Bell on October 24 and got the cards back yesterday for a 17-day TAT.